Today I'm sharing a room I just added to my portfolio featuring a bunk bed. This client has a beautiful modern house in Manhattan Beach. She already owned all the artwork and we just spruced up the room with new furniture, bedding, and a splash of color on one wall. The bunkbeds are the new Perch design by Oeuf. Since they have a low profile, they are perfect for rooms with low ceilings. 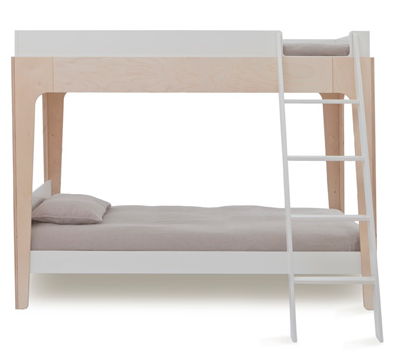 I also think the price tag of $1490 is very reasonable for bunk beds. 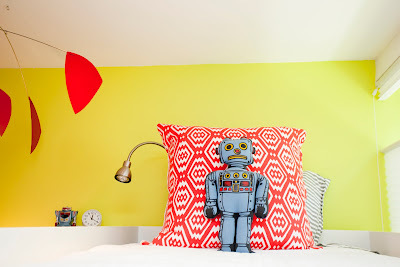 For more photos of the room visit my site Andrika King Design. hi! would you be wiling to share your source for those large solid round rugs? i have been hunting for something exactly like that for 2 years now! The rugs were custom made for the space. I love the robot pillow. Do you know the source?